Did Ellen G. White teach amalgamation of man with beast? “But if there was one sin above another which called for the destruction of the race by the flood, it was the base crime ofamalgamation of man and beast which defaced the image of GOD, and caused confusion everywhere. GOD purposed to destroy by a flood that powerful, long-lived race that had corrupted their ways before him.”—Spiritual Gifts, vol. 3, p. 64. “Every species of animal which GOD had created were preserved in the ark. The confused species which GOD did not create, which were the result of amalgamation, were destroyed by the flood. Since the flood there has been amalgamation of man and beast, as may be seen in the almost endless varieties of species of animals, and in certain races of men.”—Page 75. Point #1: What is said and what is not said. 2) That the amalgamation produced a type of man-beast species. Point #2: Context of the quote in question. The passage “amalgamation of man and beast” by itself can certainly be construed to mean “amalgamation of man with beast” but it can also be construed to mean “amalgamation of man and ofbeast.” To understanding which is the appropriate interpretation we must read the whole chapter in its context. If read, one will notice that if what Mrs. White meant was the amalgamation of animals with humans, she would have certainly spoken about that in a more in-depth way. She would have used words such as “man-beast, monsters, creatures, etc.” We can only find this two passages in this chapter, and the context will reveal why there here. "Those who honored and feared to offend God, at first felt the curse but lightly; while those who turned from God and trampled upon his authority, felt the effects of the curse more heavily, especially in stature and nobleness of form." Notice first that she begins speaking about two classes of people, those who felt the curse “lightly” and those who felt it “more heavily.” Who are these two groups of people? The descendents of Seth and of Cain. Both are addressed by their different titles: Seth’s descendents are called the “sons of God” while Cain’s are the “sons of man.” What crime did these two groups commit? When the LORD thy God shall bring thee into the land whither thou goest to possess it, and hath cast out many nations before thee….Neither shalt thou make marriages with them; thy daughter thou shalt not give unto his son, nor his daughter shalt thou take unto thy son. For they will turn away thy son from following me that they may serve other gods: so will the anger of the LORD be kindled against you, and destroy thee suddenly. “…For they will turn away thy son from following me that they may serve other gods: so will the anger of the LORD be kindled against you, and destroy thee suddenly. If what she meant was a mixing of man "with" beast, the context of the chapter would have dealt more with just that. How can animals deface the image of God by amalgamation, as they are not created in his image? 'Every species of animal which GOD had created were preserved in the ark. The confused species which GOD did not create, which were the result of amalgamation, were destroyed by the flood. Since the flood there has been amalgamation of man and beast, as may be seen in the almost endless varieties of species of animals, and in certain races of men. '—Ibid., p. 75. Note: The graphic is ours. “Every species of animal which GOD had created were preserved in the ark. The confused species which GOD did not create, which were the result of amalgamation, we destroyed by the flood. Since the flood there has been amalgamation of man and beast, as may be seen in the almost endless varieties of species of animals, and in certain races of men.”—Ibid., p. 75. Point # 4: Some critics provide sources to prove Ellen White supported Uriah Smith’s explanation of her quote. While it is true that those of the antediluvian world were smarter (I believe they used 100% of their brain, but now we use less than 10%); they did not need to write stuff since they had perfect memory, but this does not mean that they had the level of inventions we now have. We are told that in latter times knowledge will be increased. We today have what I call 'accumulative knowledge', we are continually building on inventions or knowledge of the past. The same amalgamation which took place before the flood according to Genesis 6:2 is happening presently according to Ellen White, there is nothing new or strange about this amalgamation. As I posted moments ago, there seems to be more than one application by Mrs. White of the term "amalgamation." My point has been simply this, that the worst case scenario before the flood was a possibility. Jill stumbles over that possibility in order to discredit the Testimony of Jesus. Incidently, I have never read comic books but I recall people saying that 50 years ago or more they read in comic books about space travel and going to the moon. Many believed it could never happen. "why would she couple it with a discussion of beasts? 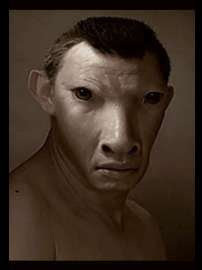 Beast breeding has nothing to do with humans marrying non-believers"
They were also a different race. But, they were pretty smart, back then. If they saw that mixing these two races produced giants, then why not mix the animals? They must have bred their dinosaurs to be as ferocious as possible. I won't flood the earth again, murderers will be put to death, and you won't have to be afraid of the animals, anymore. Jill said: "Your theory was that the race of men that amalgamated was the "race" that intermarried with non-believers. My question is, if that is what Ellen White meant why would she couple it with a discussion of beasts? Beast breeding has nothing to do with humans marrying non-believers, Ellen White would not have brought up two entirely different subjects in the same sentence like that." Thank you for that well reasoned response Jason. That parallel construction theory is remotely conceivable for the pre-flood statements, but not the post flood. Post flood - "Since the flood there has been amalgamation of man and beast, as may be seen in the almost endless varieties of species of animals, and in certain races of men.” Some of you want to change that to: "Since the flood there has been amalgamation of man as may be seen in certain races of men AND amalgamation of beast, as may be seen in the almost endless varieties of species of animals”. For that construct to work there would have to be an amalgamation of man that can be seen is certain races of men. She only had a 3rd grade education. She does her best, but she fails to make herself clear sometimes, and these flaws get blown out of proportion. She meant to say "amalgamation of man and of beasts". Lev. 19:19 Ye shall keep my statutes. Thou shalt not let thy cattle gender with a diverse kind: thou shalt not sow thy field with mingled seed: neither shall a garment mingled of linen and woollen come upon thee. That seems kind of arbitrary, but there must be a purpose for it. She probably meant to say something else, I agree with that. I know you have a good intention Rush but don't get drawn into Jill's issue with Ellen White but suggesting that it may have something to do with a 3rd grade education. "TO US" Paul was not always clear on what he was referring to but we know for sure in this case Ellen White was not referring to man joined WITH beast for she speaks of RACES OF MEN and SPECIES OF ANIMALS. A)Defaced the image of God. When the Bible and SOP speaks of "the image of God, it is speaking of physical attribute and features. Therefore,it must be referencing to something done to change that.